While hydrogen is an excellent carrier of energy for solid oxide fuel cells, its storage is expensive and dangerous. By utilizing the steam/hydrogen redox reactions of iron/iron oxide and a fuel cell, a proof-of-concept of a novel redox flow battery with a very high energy capacity of 348 Wh/kg-Fe (approximately twice that of the best lithium ion batteries) was recently reported by Xu et al. This battery, however, contains a powder bed of loose iron/iron oxide which sinters over multiple redox cycles, resulting in a loss of hydrogen storage/production capacity. The freeze-casting technique, long used to create ceramic foams (Deville), has been adapted by the Dunand group to create metallic foams of titanium, nickel, copper and cobalt. By freeze-casting metal oxide powders and subsequent reduction and sintering, full metal foams are created. 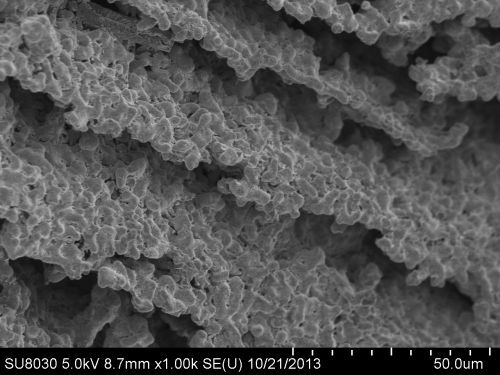 This project is to develop directional freeze-casting to create iron foams with elongated, interconnected channels as well as high microporosity for the use in iron-air batteries. The porous scaffold architecture will mitigate the degradation (e.g., sintering, fracture, surface area loss) resulting from with the large volume changes occurring during the redox cycles. Figure 1. Deville Phase-diagram: Phase diagram of water showing the schematic process of freeze-casting. Figure 2. 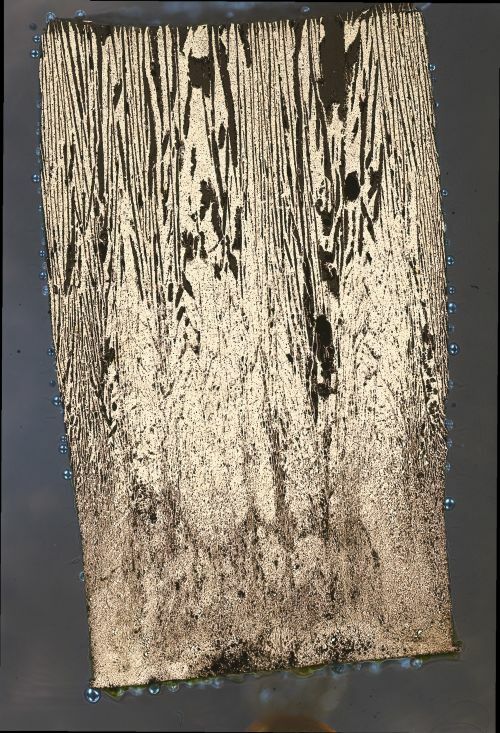 Vertical cross-section of an iron foam created by freeze-casting iron oxide, sublimating the ice crystals, reducing the oxide in hydrogen, and sintering. Freezing direction is from the bottom-up. Xu, N., Li, X., Zhao, X., Goodenough, J.B., Huang, K., 2011. A novel solid oxide redox flow battery for grid energy storage. Energy & Environmental Science 4, 4942-4946. Deville, S., 2008. 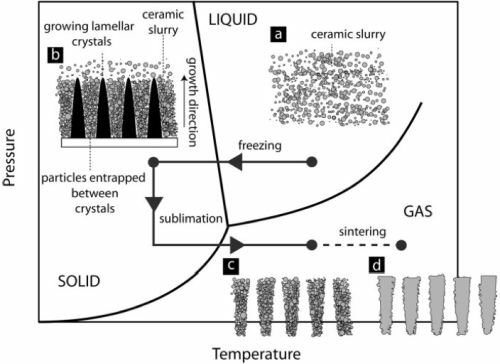 Freeze-Casting of Porous Ceramics: A Review of Current Achievements and Issues. Advanced Engineering Materials 10, 155-169.